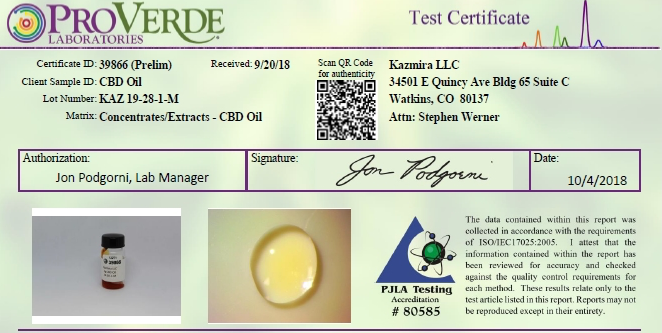 How to Read Certificate of Analysis of Industrial Hemp Derived Products? A certificate of analysis (COA) is a lab report on the chemical make-up (e.g., contents) of a product. In the context of Industrial Hemp derived products, the COA shows the contents of the cannabinoids & other tested compounds such as heavy metals, etc. COA’s are used to verify that the contents of the product are matched to the advertised or marketed product. These reports are important for verifying that hemp extracts have less than .3% THC, as determined by the definition of Industrial Hemp in the law. Our THC-Free products at Kazmira have ‘non-detect’ levels of THC reported, which we will discuss in more detail later. Also, tests are carried out to check for dangerous compounds such as heavy metals or pesticides and reported in the certificate to ensure the safety of the end consumers. There are many new emerging manufacturers of CBD, and in an unregulated industry, this can be costly for consumers who may not know exactly what they are paying for. For nutraceutical or homeopathic applications, knowing the exact potency and ingredients is extremely important. For example, manufacturers could claim a CBD product contains no THC, or claim a certain potency in their product, but since there is little oversight, the opportunity to “fudge the numbers” is compounded. This could be a major issue for people who are choosing products without THC in order to avoid its psychoactive side effects or pass a drug test because of a job. A study conducted in 2017 found that almost 70% of online CBD products are mislabeled, either having substantially more or less CBD than advertised. Labeling alone is not reliable, especially when sold online to customers who do not fully understand the convoluted regulatory status of CBD. This is the reason COA’s are becoming a standard for reliable, law-abiding CBD manufacturers. They create transparency for consumers as well as regulators and clearly identify exactly what is and is not inside a given hemp extract. How do I read a COA? The first thing you may notice on a COA is that the company who performed the lab test is not the same company who is selling the product. This is called a ‘third party’ test and it is to ensure transparency in the results. If it was only tested by the company selling the product, there could be bias in the report. *This description is specific to the example COA provided from this third-party lab, but all of the elements described should be present on any COA, regardless of format. On the top left, there is information to identify the product which was sent to the lab including the batch which it came from. On the top right, the address and contact person of the company selling the product is stated. The QR code in the top center can be scanned by anyone to verify the authenticity of the report. It links to the lab that performed the analysis so consumers can cross check to make sure the COA was not fabricated. The authorization signature is provided by the third party lab manager to verify the report is correct and authentic. 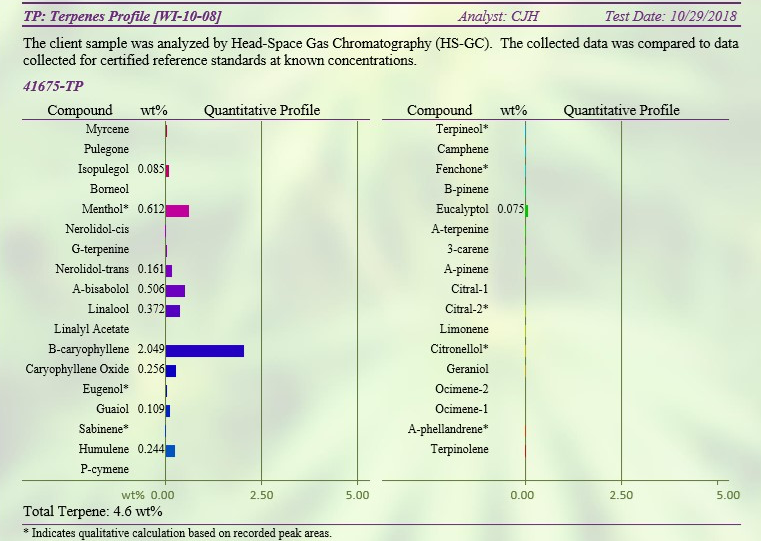 The bottom half of the first page shows the cannabinoid profile of the sample, or the cannabinoids which were detected as well as their concentration. This is probably the most important section of the COA because it tells consumers exactly which cannabinoids are present and at what potency. 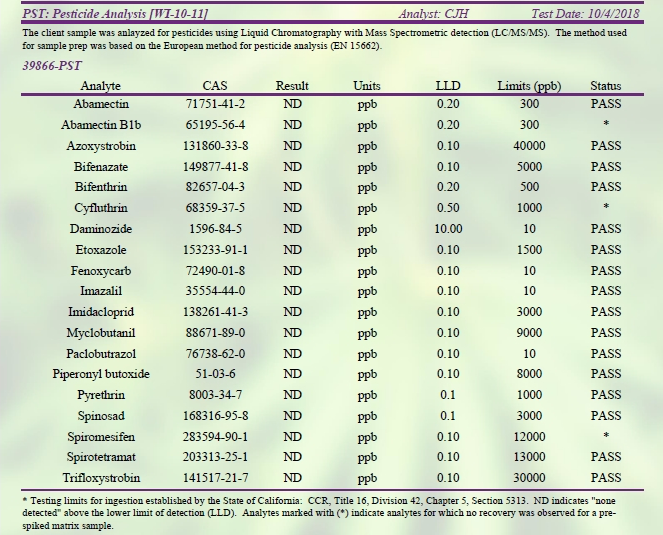 The ID column of the chart indicates which cannabinoids were tested for. D9-THC is the psychoactive component which must be lower than .3 weight % (middle column) in order for it to be legal. ‘ND’ stands for ‘non-detect’ meaning there was such a miniscule amount, if any, in the sample that the laboratory instruments could not detect it. Essentially this means it is not present in the product. All Kazmira products which are labeled THC-Free are tested to have ND levels of THC. This specific report is analyzing a CBD oil said to have no THC, which is reflected in this table. CBD, CBDV, and CBG were detected in the analysis and their concentration is reported in milligrams per gram of the product. This ‘Conc.’ column is the potency of the tested CBD oil, which should be compared to the CBD concentrations advertised on the label of the product. On the right of the chart is a bar graph corresponding to the relative amounts of the various cannabinoids in the product sample. The heavy metal analysis chart indicates which metals were tested for with the chemical symbol and name. ‘Conc.’ is the concentration of the metal measured in the sample. ‘Units’ refers to the measurement size, in this case micrograms per kilogram (1,000,000,000 micrograms in 1 kilogram). MDL is the lower limit of detection for the lab instruments. ‘Use Limits’, the most important of which being ‘Ingestion’, is the amount determined by the state Department of Public Health and U.S. Pharmacopeia that is safe to ingest per day. In the case of this report, lead is the only metal detected and it is well below the allowed limit. 11 micrograms per kilogram were detected while the standardized safety limit is 1000. Another report in the COA is the pesticide analysis, which lists a number of common pesticides tested for in the sample. The unit in this case is ‘ppb’ or parts per billion. LLD is the “lower limit of detection” based on each specific pesticide, and the ‘Limits’ column is the maximum amount allowed for consumption based on safety regulations established in the State of California (these values may vary slightly depending on the specific state or federal guidelines identified in the report). The ‘Status’ column indicates PASS if the sample is under the legal limit or NO PASS if the levels are above the limit. In this report, no pesticides were detected. In an industry which is quickly expanding with limited regulation, it is extremely important that as a consumer, you know exactly what you are purchasing. Certificates of analysis provide transparency and assurance to consumers so they can be confident in what they are buying. This is especially important when using hemp products, where dosage and safety are vital for its effectiveness. Although COAs vary in appearance depending on the lab, the basic information presented in this article should be present on any third party COA. Contact information for both the producer and the lab should be present in order to verify authenticity. Dates and product batch numbers should be listed so consumers can make sure the report is up to date and that the specific batch they are purchasing was the same batch that was actually tested. The cannabinoid profile should match the product description. THC-Free broad spectrum hemp oils should have CBD, other cannabinoids such as CBG or CBN, but non-detect levels of THC. Full spectrum hemp extracts should have many cannabinoids including D9-THC, as long as the THC weight % is below .3%. The COA should also be used to verify the potency of the product. Heavy metal and pesticide analysis can be used to ensure that the hemp which product was extracted from was grown safely and is safe to consume. Companies which do not provide certificates of analysis should be avoided because their products could have contamination issues. If the COAs are not provided or are not up do date, it is important to request the most recent COA before purchasing hemp extracts.